This is the second account of the birds of Ghana (ex-Gold Coast), the first having been published by Grimes in 1987. It presents detailed information on the some 750 species known (among which there are 150 migrants from Eurasia and North America, of which more than 100 winter locally). Extensive field-work by the authors, augmented by the contribution of visiting or resident naturalists, means that the maps (for all species except vagrants) present a clear picture of distribution in this country of nearly 240,000 km2. The text complements the maps, with a synthesis of what is known of ecology, status, movements, breeding seasons, taxonomy and conservation concerns. Some 600 published references are cited, and there are details of ringing recoveries and a gazetteer of more than 860 localities. In 116 pages, the introductory chapters review the vegetation and major bird habitats, biogeography, migration, conservation and the history of ornithological exploration in Ghana. The conservation chapter draws attention to the considerable pressure that human activities (including deforestation, danis and over-fishing) are exerting on the environment and wildlife. Six species of birds have become extinct in Ghana in the last century, and several others are heavily threatened. Forty-nine species are considered to be of global or regional conservation concem, and the importance of the country’s wildlife reserves is stressed, with forest reserves and other natural habitats being decimated at an alarming rate. 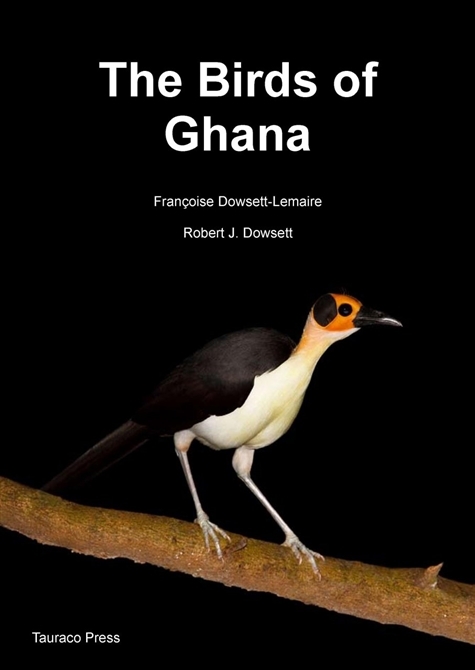 Twenty-one pages of colour photos illustrate the habitats of Ghana as well as a selection of typical bird species. No bird is endemic to Ghana alone, but the country contains no fewer than 179 Guineo-Congolian forest species, including all but four of those endemic to Upper Guinea (Ghana westwards), Ghana is the one country where the striking Yellow-headed Picathartes (or Rockfowl) can be seen by all visiting birdwatchers.